Hams impoverished for space to erect a ‘full size’ antenna for HF pursue a range of options and end fed wires figure highly. New hams who heard the maxim that ‘any antenna is better than no antenna at all’ will try to use bed frames, window frames, balcony railings, anything metallic to get on air. This cry for mediocrity is to prevail over a quest for understanding, ham radio as it has evolved. (VK2AVR 2014) states do not use a powdered iron toroid.. they won’t work . They cannot both be correct. (PA3HHO nd) gives a design for an antenna system that incorporates a matching transformer using a T140-43 core for 40-10m bands. Above is PA3HHO’s transformer, it is an autotransformer with a two turn primary, and the concept is to adjust the antenna length for a ‘perfect match’. Some other designs use a variable capacitor in parallel with the secondary to ‘tune’ the system for best match. 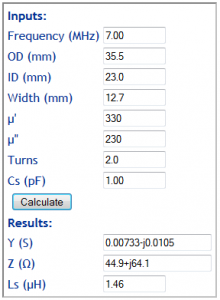 Either way, if the system delivers a 50Ω resistive load to the coax connector, then a good approximation of core losses can be obtained by measuring or estimating the complex impedance or admittance of the two turn primary winding. 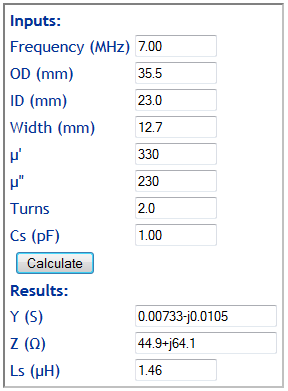 just over one third of the input power is converted to heat in the ferrite core. Not an attractive proposition if using QRP (as is almost always the case with these things). PA3HHO. nd. Multi/any band end fed. http://pa3hho.wordpress.com/antennes/multiany-band-end-fed-english/ (accessed 08/09/2014). VK2AVR. Sep 2014. Posting on VKLOGGER.COM. http://www.vklogger.com/forum/viewtopic.php?f=41&t=12537&p=49320#p49320 (accessed 08/09/2014).